The teeth of the common limpet species (Patella vulgata) are tougher than Kevlar and stronger than spider silk, researchers report in the Feb. 18 issue of The Royal Society journal Interface. Asa Barber, a professor of mechanical engineering at the University of Portsmouth in England proving that the sea snails have teeth that made of the most strongest material. Bodied vegetarian snails average of five centimeters turned out to be stronger than spider webs, titanium, or kevlar. 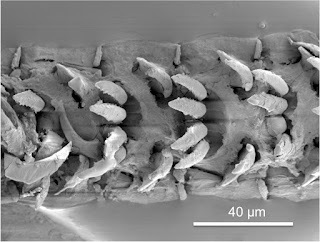 The teeth have a protein composition frame and goethite fiber content. Goethite is a kind of oxide minerals commonly found in soil and low temperature environment. 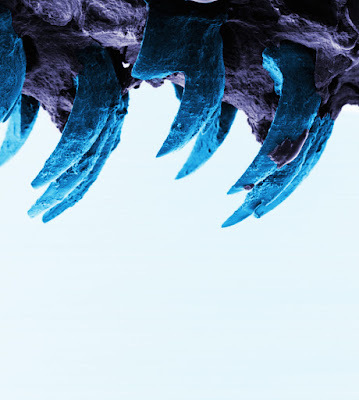 This mineral is a constituent material of iron ore.
To separate the teeth in the laboratory, Barber requires a pressure of 6.5 Gigapascal (GPa). While cobwebs requires 4.5 GPa and kevlar only 3-3.5 GPa.